My father was my biggest fan in life. I spent 40 years with this man cheering me from the sidelines. He taught me how to throw a baseball, how to drive, how to dance standing on top of his feet. He introduced me to doo wop music. He wiped my tears and gave me butterfly kisses. But most importantly he taught me how to appreciate life and the importance of family. 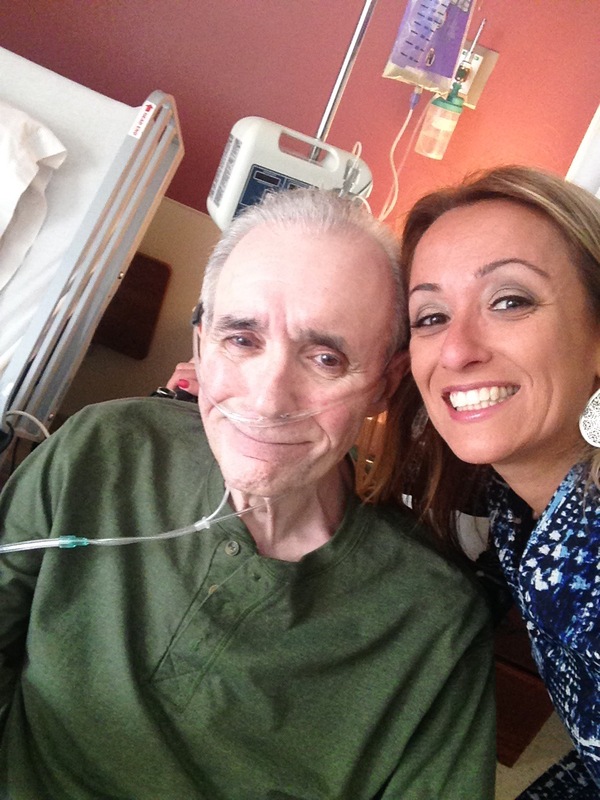 At the young age of 61 my father was diagnosed with Stage IV base of the tongue cancer. Although he was cancer free for 7 years his body slowly deteriorated from the intense radiation damage. The radiation damage so fierce it was like watching Superman receive a dose of kryptonite. He was still my father but became a man who was dependent on my mother and could no longer take care of himself. A week later my father died surrounded by family. Days after my father’s death I was rummaging through papers on my parent’s kitchen counter and next to my father’s extensive collection of medications was the gigantic binder from hospice. Feeling extremely anxious, I decided to take a peek at all the handouts hospice gave us. I know what you’re thinking, but please understand for me accepting my father’s mortality was something I struggled with. It’s something I’m STILL struggling with. Right in the middle of what seemed like hundreds of papers was an explanation of “Anticipatory Grief” and how to handle it. I read it and it hit me like a ton of bricks. Defining Anticipatory Grief: Anticipatory grief is the name given to the tumultuous set of feelings and reactions that occur in some people who are expecting death in a loved one. What? You mean hospice was right? Anticipatory grief also has some symptoms that are distinct from normal grief. These signs include getting ready for what life will be like after the loved one is gone. As my father’s health grew more and more dismal I tried my best to prepare myself for his death. On one particular occasion I became so upset I had to pull over from driving because my tears and emotions so overwhelming. I remember feeling like I was drowning, I was sobbing so much I could barely catch my breath. Sadness– there is no way around it, watching my father fight with every ounce of his being to survive made my heart heavy. I had no shortage on tears. Anger – I was enraged that my father was given this uncharted path in life. Towards the end of my father’s life I had to tune out anyone partaking in a fad diet. In my eyes, my father’s ability to eat was stolen and I could not understand fad diets. Food became the symbol of my father’s struggle. In so many ways it still is. 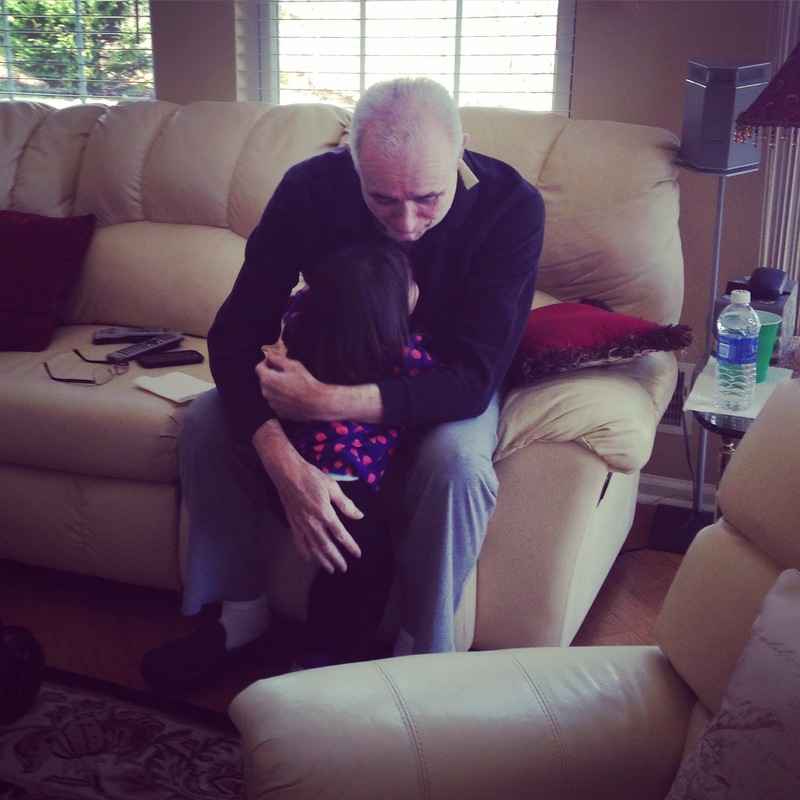 Fear – I lived in constant fear of losing my father. Could I survive this? Was I strong enough? Fatigue – I tried to disguise my fatigue, but I was mentally exhausted. On numerous occasions I would see someone’s lips moving and I knew they were speaking to me, but I was too tired to listen. Think Charlie Brown teacher speaking. Anxiety– Each time my phone would ring my heart would race. I was petrified that my father would die and my mother would not be able to reach me. I began to sleep with my phone next to my pillow. My phone became an extension of my body. If I misplaced my phone for just a minute panic would set in. Many times tears would fill my eyes thinking of my Dad from back when he was strong and healthy. My advice to you is if someone you love is terminally ill do NOT do what I did. I should have listened to the experts, or at the very least given them a chance. Accepting my anticipatory grief may have allowed me to prepare emotionally for my father’s death. My Dad lived on a peg tube for the last 4 years of his life. The last year of his life he was housebound. The last 4 months of his life he was on hospice unable to perform basic tasks. I wrote the below journal entry in September 2015 with the exception of the last three paragraphs that I recently added. You remember my Dad, he was the life of the party, he could make anyone laugh. When I was 5 years old he told me chocolate sprinkles were chocolate covered ants. I haven’t had chocolate sprinkles since. He was the tall, good looking guy that all of my dates were afraid of. He had a zest for life. Dad isn’t doing well these days. With each visit I say good bye to a little piece of him. A few days ago his hospice nurse told us he is showing signs of sundowning. Sundowning is symptom of Alzheimer’s disease and other forms of dementia. How can life be so cruel? He hasn’t eaten in 4 years, he is housebound and now this? Please God don’t let my father die unable to eat and remember his loved ones. Our heart to heart conversations are a thing of the past. I sit next to him on the couch and watch him stare at the television and shake in pain. We sit in silence holding hands with tears building up in our eyes. My father ends each visit apologizing to me for not having the energy to talk. I don’t care, I just want my father in my life. He screams in pain, his body is so frail and skinny. He no longer looks like the athlete you remember. He lives on a peg tube that is connected to a feeding pump. His feeding pump runs 16 hours a day. He stays in touch with his friends and family through emails, although typing is becoming a struggle for him these days. Close friends and family visit and stay in contact. When he’s feeling up to it, I catch him watching the Ranger games texting furiously. Whoever you are THANK YOU! You made him smile today. Please don’t wait for my father’s funeral to visit. Please don’t let your fear of what if’s hold you back from visiting. Please don’t tell us you would visit but you are uncomfortable eating in front of a man who cannot eat. Please don’t tell you would visit but you know things are hectic. This is Al, the guy who would walk 500 miles barefoot to visit you. So please before it’s too late visit my Dad. We simply smiled and ignored the comment mainly because our grief is consuming us. But what I WANTED to say is, if it’s too much to handle for YOU imagine his wife who shares a lifetime of memories with him or his children share his DNA and pride themselves on being “Daddy’s girls.” Don’t you think my father’s immediate family would have appreciated your support? 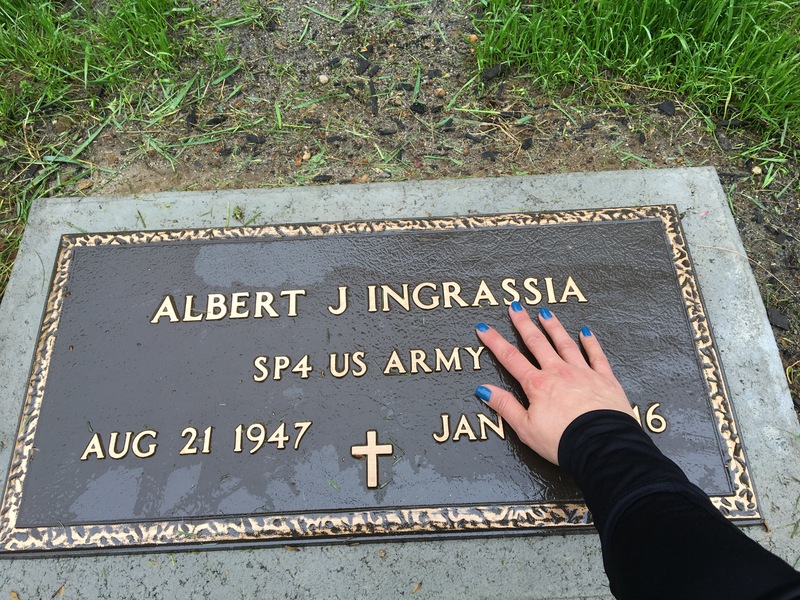 Right up until my father’s last breath he treasured his friendships and family. There is no script on how to act when a loved one is terminally ill. But one thing is for sure the calls, the texts and the visits not only make the patient smile it makes the family smile and realize their loved one is a legend. And my Dad was a legend.